The internet has changed forever the way we now do business. Shopping malls are reinventing themselves as millions of Americans now use Amazon Prime to buy virtually everything they need, with free shipping. I could go on and on, but instead I’ll jump right to the point of this article. Does your company own any generic noun website/domain names? To become or remain a dominant player of industry, your brand should be associated with a generic noun .com domain name like the ones below. Why does Bank of America have the domain name www.loans.com and why would CITI Bank pay $1.8M for www.mortgage.com? Did you know that aside from owning www.Intel.com they also own www.PC.com. Ditto for Apple also owning www.MAC.com. Facebook owns www.FB.com paying $8.5M for it in 2010. Addressing an even more recent fringe internet offering, Budweiser recently purchased the emoji version of three mugs of beer looking like this 🍺🍺🍺.ws to point to www.BUDWEISER.com. A picture is worth a thousand words and emojis translate all 7,000 languages of the world, not just one. This also makes sense as mobile is expected to soon be the internet device/platform of choice 80% of the time. These companies GET IT and figured it out a long time ago. Just as the invention of the automobile changed forever the horse and buggy world of transportation, the new internet economy we are now a part of has a completely new set of tools for maximum navigation. For a business to operate successfully on the internet, they must fully understand just what that means. For one, a dynamic and responsive website is an absolute must. An app may also be required along with social media presence on multiple platforms. Finally, having the generic noun domain/website name is becoming a must. Take Summit Sports, LLC as one example. They were brilliant to purchase Snowboards.com and Skis.com. 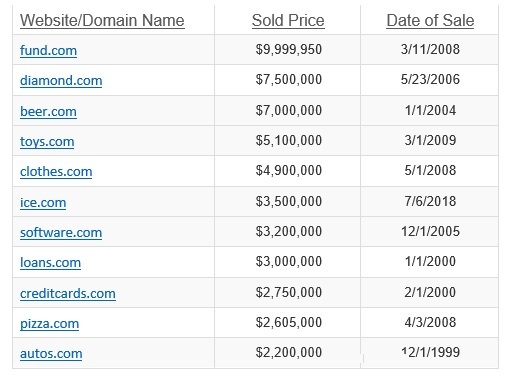 Those website/domain names were for resale just a few years ago and leading manufacturers passed on them. Now Summit Sports has a huge on-line presence for lovers of the great outdoors to purchase and acquire sporting gear, apparel, etc. versus the manufacturer having the ability to control the market and pay no middleman in the process. The stock price of CSGP or CoStar, the Apartments.com company has nearly tripled in the past 5 years with the acquisition of Apartments.com as they are bound and determined to become the absolute leader in apartment rental. They are now a billion-dollar company and you can bet, acquiring that name was a big part of this. Finally, let’s talk about Cars.com. A 2016 financial document puts the website/domain name www.CARS.com at a market value of 34% of assets, around $800M. I think that’s a bit of a stretch, but it does make a bold statement that with the right website/domain name, a company’s value through increased revenue can grow substantially. Do the math. If you wanted to be Abe Froman, the Sausage King of Chicago (Ferris Bueller reference for those of you living under a rock) then you should have purchased www.sausage.com. If you sell flip-flops and want to be the biggest and the best, then make sure to buy www.flipflops.com. Full disclosure, I have invested in hundreds of website/domain names. I sure wish I had a time machine and could go back to the future for a money grab of these now extremely valuable domain/website names.